The inspiration for this portable bar soap was actually my workplace. (My workplace outside the home, that is). It has some of the most harsh and awful soap available that man or machine has ever dispensed. I swear it can peel a layer off your skin in seconds flat. I wanted to have some of my homemade soap at work, but I would need to keep it on my person since it is a rather large workspace I share with over 100 employees. Carrying a bar of soap is just messy and well, inconvenient. I have never mastered, or even attempted the fine (meticulous) art of making my own liquid soap, so carrying a small vial of that was out. Frankly, I leave making liquid soap to the pros like Marie over at Humblebee and Me. DH and I do have fun making bar soaps though, and the other day I was inspired to order some push tubes and give convenient, mess-free, portable bar soap a try. There had to be a way, right? The result was so fun and easy, it’s a wonder that we didn’t do this earlier! We made a simple soap of lard, coconut oil, olive oil, and coconut milk and poured it into the push tubes. We used the hot process method, so the soaps were ready for my next day of work. When I ordered the push tubes, Bramble Berry sent me a free sample of their lavender and cedar fragrance oil, so we decided to give this soap a lavender color using alkanet root to match the lavender scent. For more info on using alkanet root to color, read my post about Ruby Lip Tint. Scoop finished soap recipe into the tubes and tap down hard on the counter top several times to settle the soap and release air pockets. That’s it! Easy peasy. I’ll share the recipe for the lavender soap at a later date; but for now, I’d love to share some push tube soaps with you! I’ll send two (U.S.) readers of Sustain, Create and Flow each one Bar Soap To-Go. The tube is about 3″, and holds 1 ounce of soap. 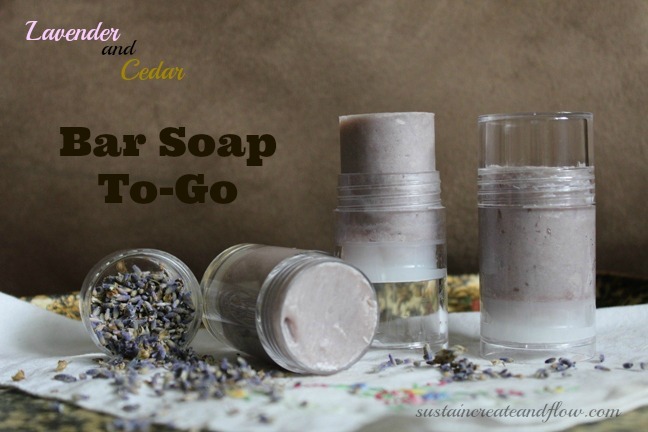 The soap is lavender in color with a lavender and cedar scent. It’s dreamy. All you have to do is enter the Giveaway below! Disclaimer: I am giving away these products handmade by me in my own home at my own expense. Please do not enter if you are highly sensitive to specific ingredients or are allergic. I cannot be held responsible in the event of an adverse reaction. I entered the raffle! I think, I’ve never done it before so hopefully it worked :). I’m very excited I would love to try this. I have an infant, my very first baby ♥ and it would be amazing to keep this in my diaper bag! And maybe it might just give me the push I need to try and make my own soap, which I’ve been to scared to do this far. Keeping my fingers crossed! I wish I could make soap, but it’s just so much easier and less scary to let someone who knows what they’re doing make it for me! I love the push up soap idea! I hate the industrial strength stuff that seems to take a couple layers of skin with it down the drain. This would be the perfect soap to take with me while traveling this year. I love this idea! So perfect for when all that is available is nasty, icky soap. I like bar soap, but it always makes such a mess! This is a creative, unique idea. This is so cool. In the winters my hands get so dry from washing. What a great idea! And fun to try making with the kids!! Thanks for sharing your brilliance. This is just an interesting creative idea. Would love to try and see how it works. I would love a soap to carry with us that didn’t dry out our hands! I think this is such a great idea! I made a batch of soap and poured it into an empty deodorant stick and it slides beautifully without alcohol. This would be great to take camping and/or hiking. Just curious if you’ve given any thoughts to cross contamination (dirty hands touch the tube, clean hand touch the now-dirty tube). Wondering if I’m missing a step. This is awesome. I’ve been looking at making my own soap for a good while now, and the push tube idea may have put me over the edge. It’s genius, I can’t believe I have never thought about that before. John, I seriously love it.